The Lappen tree nursery is located in the heart of Europe. Its central location in the Kaldenkirchen area of Nettetal means that European metropolises such as Paris, London, Amsterdam and Brussels are within very easy reach by air, rail or road. 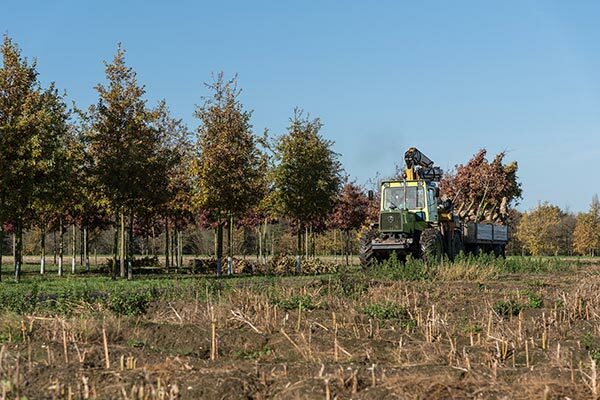 In addition, the tree nursery’s domestic and international customers can utilise our pick-up service from railway stations and airports if they wish to view the trees on-site. The location in the traditional tree nursery area of the Rhineland region offers a balanced temperate and excellent climate. The good and fertile soil bestows the plants with continuous and healthy growth. The Lappen tree nursery is therefore still able to deliver plants during most winters without interruption. Lappen is capable of delivering orders to customers on a "just-in-time" basis. On 20 October, at the age of 24, Adolph Friedrich Lappen submitted a building application for a dispatch building to the Kaldenkirchen Municipality.